Sometimes I get carried away with my cooking ethic: Never throw any food away, and sometimes watching Food Network's "Chopped" can come in handy and spark your imagination! This next recipe came about with what I had left in the fridge. Worthy of a holiday appetizer I'd say. In a large frying pan, heat 3 Tbsp. of the oil. Add the garlic and saute until soft. Add the broccoli and saute for 2 to 3 minutes. Add the wine and oregano and cook for 2 to 3 minutes. Let cool. Unwrap refrigerated pizza and dough and stretch to fit your pan. Lightly oil your baking sheet. Brush the dough with the remaining 1 Tbsp. olive oil. 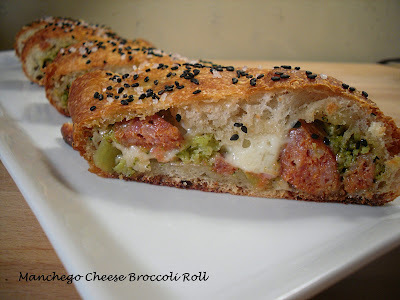 Spread the broccoli mixture over the dough to within 1/2 inch of the edge. Scatter the diced sausage and cheeses over the dough and sprinkle with salt and pepper. Starting with the long side, roll the dough up tightly like a jelly roll. Pinch the seam to seal and position the roll so the seam is on the bottom; tuck the 2 ends under the roll. Brush the top with a little olive and sprinkle with coarse salt and sesame seeds. Bake at 375 degrees for about 20 minutes or until golden brown. Let cool slightly and cut into thick slices. Of course you can substitue any ingredients in this recipes. Pepperoni would be great, and of course, mozzarella or provolone. The Manchego cheese adds a nice, sharp bite to this roll. Looks divine! Made something similar to this a few months ago. Great post. Hi Cathy, You can cover most of the dough, but make sure you leave enough room to seal it. Let me know how it comes out! Thanks for visiting!